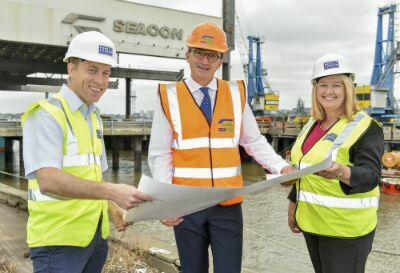 Reviewing Seacon's expansion plans: PLA chief executive, Robin Mortimer; Seacon chairman, James Roth; and PLA chief financial officer, Julie Tankard. 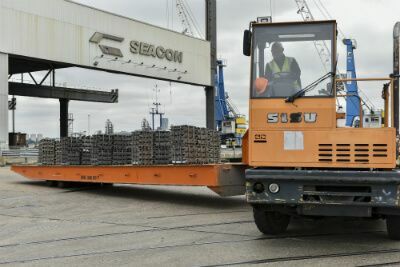 Seacon’s business is centred on handling construction products, forest products, metals and steel coils, much of it dependent on all weather handling via their covered berth. The investment project has involved the acquisition of land next to Seacon’s original site, delivering an additional 10,000m2 of outside space. By removing old buildings, the company has created additional trailer space essential for its logistics contracts. And in a first for the business, it opens up the opportunity for ship to barge transfer of materials for onward movement to sites in London. The project supports delivery of the Thames Vision, the development framework for the river which targets greater river use. Key among the Vision’s targets is encouraging the low carbon movement of freight between terminals on the Thames, keeping lorries off London’s congested roads. “By increasing our land bank, we are realising new opportunities for our business using the river,” said James Roth, chairman of Seacon Group Ltd. “This expansion enables us to realign the trailer park and create additional outside storage space, opening up opportunities for handling building products and serving key construction projects, where we see significant growth opportunities. The Port of London Authority (PLA) led development of the Thames Vision. Chief executive, Robin Mortimer and chief finance officer, Julie Tankard visited Tower Wharf to see how work is progressing. Founded in 1955 as Sea & Continental Waterways Transport Ltd, Seacon has offered its customers 'door-to-door' transport solutions for over half a century. Seacon Group Limited is a private company, owned by the Roth family. Its services are focussed on shippers of neo-bulk cargoes such as steel, metals and forest products. These commodities benefit from the combination of specialist ships and handling facilities the company provides at Northfleet in the Port of London. In 2004 the Seacon Group acquired Stanton Grove Limited, a specialist in the handling, storage and distribution of forest products. Stanton Grove operates a large warehouse facility in the port of Tilbury. In January 2018 Stanton Grove Limited was renamed Seacon (SG) Limited. Seacon Group employs some 80 people, handles around 750,000 tonnes of cargo at its own terminals, with turnover in excess of £18 million.